While OnePlus 2 has been confirmed to be running V2.1 of Snapdragon 810, which is expected to run far cooler compared to its chipset variants from Qualcomm, it could not be stated what screen size the handset would be sporting, until now. Thanks to the latest leak, which happens to be in the form of a sketch, we now have a glimpse that the screen size of OnePlus 2 is going to be between 5.5 to 5.7 inches. In short, OnePlus is looking to maintain the same phablet sized form factor that it did with its OnePlus One. 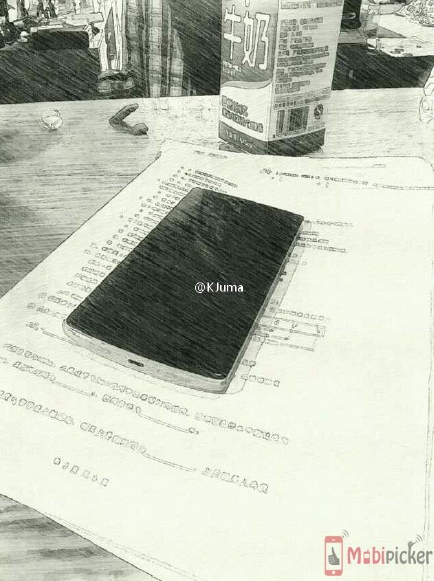 According to Chinese website Weibo, a username featuring the nick @KJuma has leaked a sketch of OnePlus 2. The sketch reveals that the screen size of the upcoming handset is going to be between 5.5 to 5.7 inches. While details are currently unavailable as to which resolution OnePlus 2 will be sporting, we are certain that a 1440p one will be resonating from the phablet sized screen of the handset, seeing as how that is the mainstream resolution of current generation flagship devices. If OnePlus 2 does happen to feature a 5.7 inch screen, then OnePlus will have sufficient space in order to accommodate a larger battery, and when we speak about a larger battery, we mean one that can hold more than 3,100 mAh of charge. Other specifications of the smartphone include a Type-C USB port; an announcement that was made public through a tweet from the company’s official page. As for the octa-core processor; most likely the four cores belonging to Cortex-A57 will be clocked down to 1.8 GHz in order to keep temperatures under their limits. Additionally, OnePlus and Qualcomm engineers have devised a method which will help to alleviate the overheating property of Snapdragon 810. Before we conclude this leak, OnePlus 2 is going to feature a much larger starting price as compared to OnePlus One, which is why for now, Doogee F3 happens to be the most affordable Snapdragon 810 to purchase; retailing for $350. So which handset have you set your eyes one? Doogee F3 or OnePlus 2?